And there is plenty of proof of that: his achievements both at home and abroad. 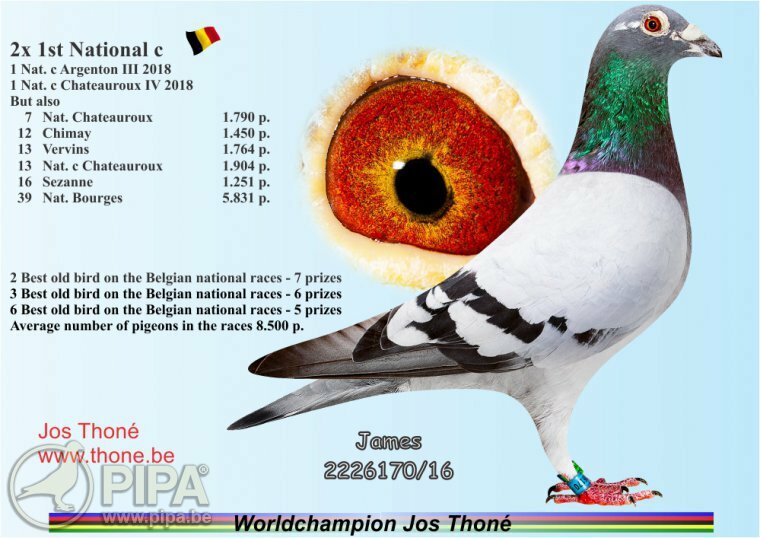 His racing birds have been doing really well in pigeon races across the globe - from Portugal over Iraq to China - and this in turn has made Jost Thoné a world famous fancier. 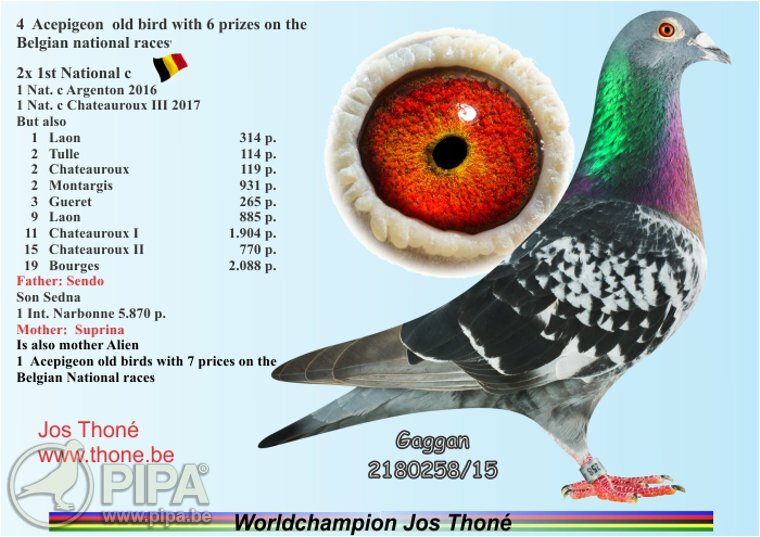 Right upon visiting Jos for this new report, he showed us a new mail: Danish top fancier Bent Thomsen Petersen had recently won the Derby Arona Car Race with "Jos 086", a pigeon of his good friend. This renowned fancier proudly and gratefully announced that the parents of his car winner "Jos 086" (who beat 1051 pigeons) were two Jos Thoné descendants. His sire 027-14-4236 is a grandson of "Coco" with ring number 027-08-656, and his palmares includes a 1st Prov. of 1,935 pigeons, several ace pigeon titles and five first prizes in Sector 42. 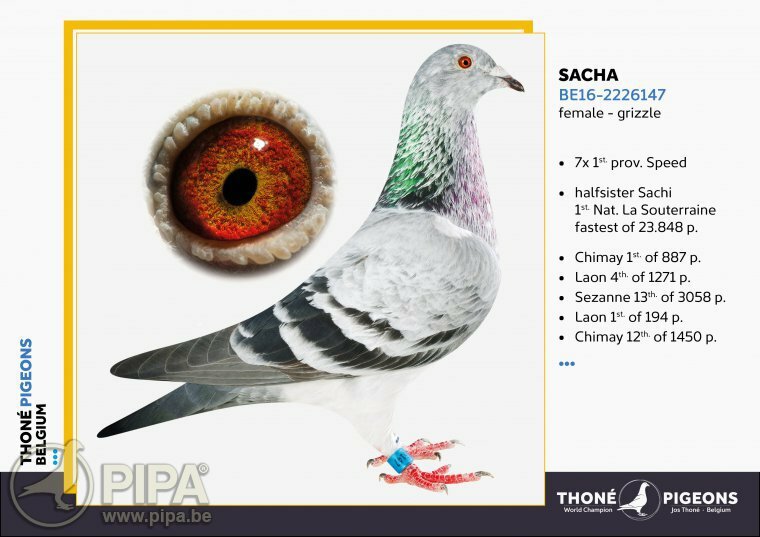 His dam is 027-15-5536, a daughter of "White Opus" 027-09-811 x B-07-508004 sister "Avril", one of those world famous pigeons from As, and a nephew of Bill, Pano, Sacha and Billy. Click here for Bill's pedigree. Bill is a brother of Billy, 1st National C Gueret 2018. Click here for the pedigree of Billy. 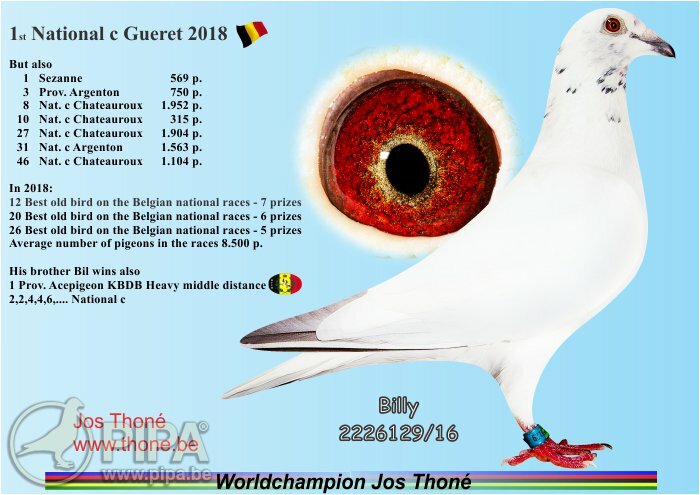 And Iraqi fancier Ali Obaed sent in a word of thanks as well, which we had translated specially for this report: "Dear Jos, I had two super class pigeons in my team over the past two weeks, and they both come from your team. The pigeons, which each finished in second place in two races (545km with 1,569 pigeons and 690 km with 1,300 pigeons) were 100% Thoné pigeons, and they were in fact a brother and sister of my winner in South Africa. 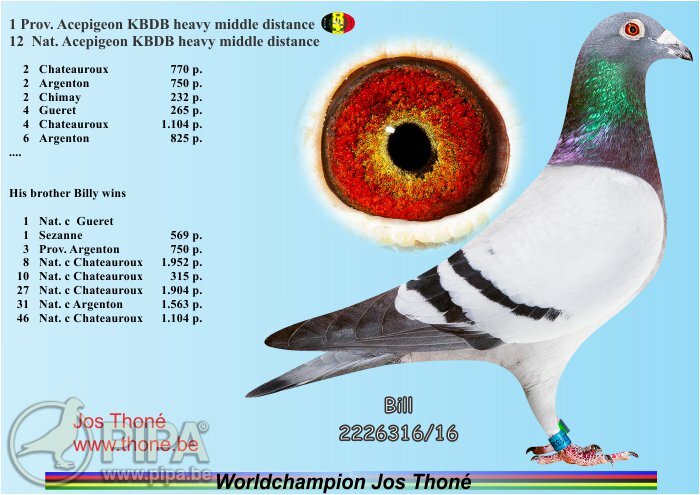 The winner in the 690km race is a 50% Thoné pigeon. They are all three grandchildren of "Dochter Kirin" BE 13-5020217. And she is quite a super class bird indeed: 7 of my best 15 pigeons are youngsters or grandchildren of her. 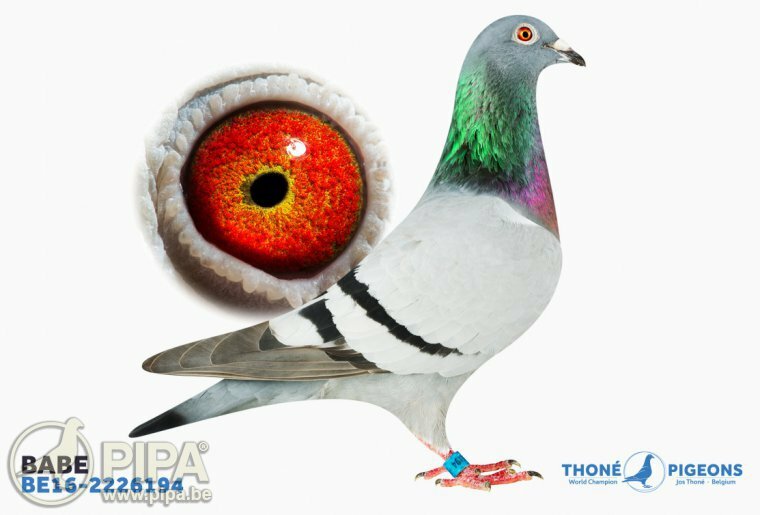 Thank you for these top class pigeons, which I was able to obtain through PIPA." 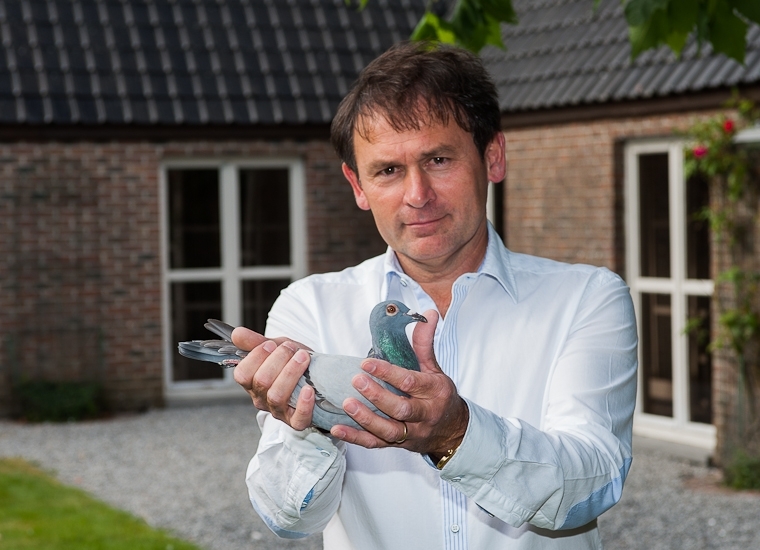 "There are two reasons why I am so pleased with such mails: the fact that the fancier is grateful for the successful pigeons that he purchased from me, and the fact that my pigeons are delivering fantastic results in competitions across the globe", says a proud Jos Thoné. He developed a vision using his craftsmanship, and his ability to motivate his pigeons and to get them ready for big races like a true team manager. And with that comes a clear vision, and of course a top class breed. 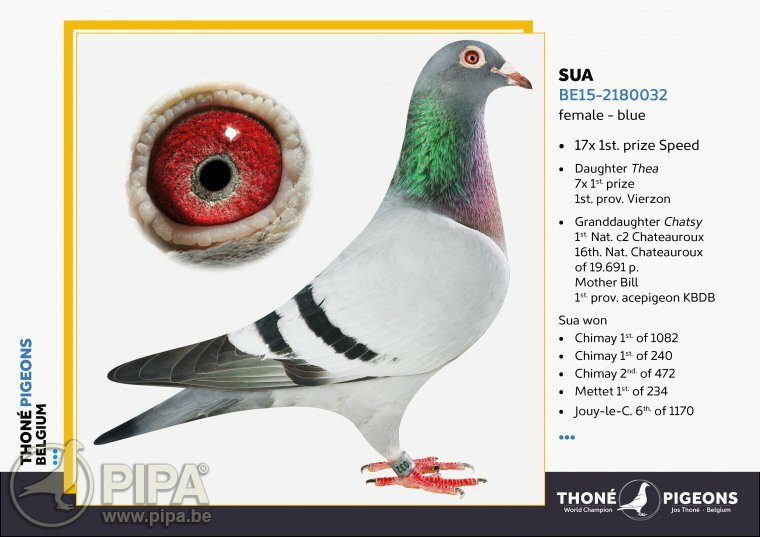 "My 2016 auction, in which I auctioned my entire old birds' collection, has made it clear that I have been selling some good or even very good pigeons over the years, and that my pigeons have continued to deliver here in Belgium as well. A big thanks to my team." This has been an exceptional career indeed, with an extensive palmares won by an all-round champion, who surrounded himself with a group of highly talented pigeons over the years. 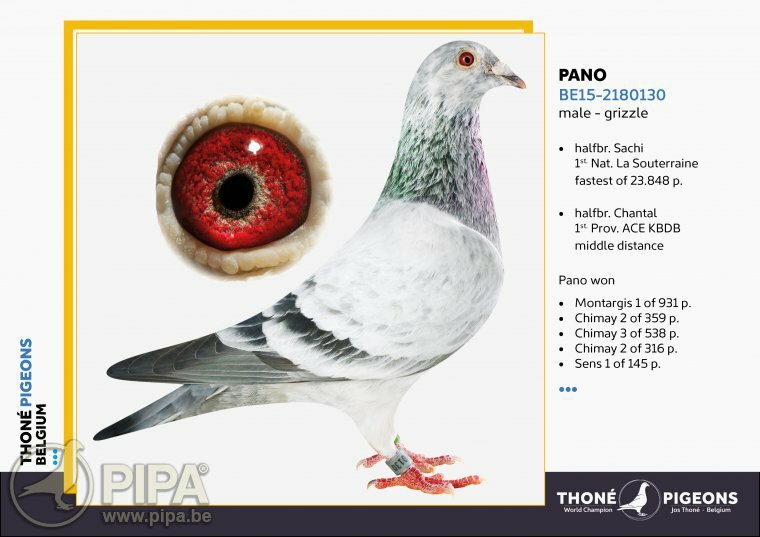 His experience in breeding pigeons enabled him to achieve top results time and time again - his 2018 palmares is a good example. 5 x 1st Nat. c  , 5 x 2nd Nat. c, 4 x 3rd Nat. c …. All of his old birds were sold through PIPA in 2016. But Jos maintained his status nonetheless, and he continued to deliver. In fact, the pigeons that were sold in auction have also contributed to his international reputation. 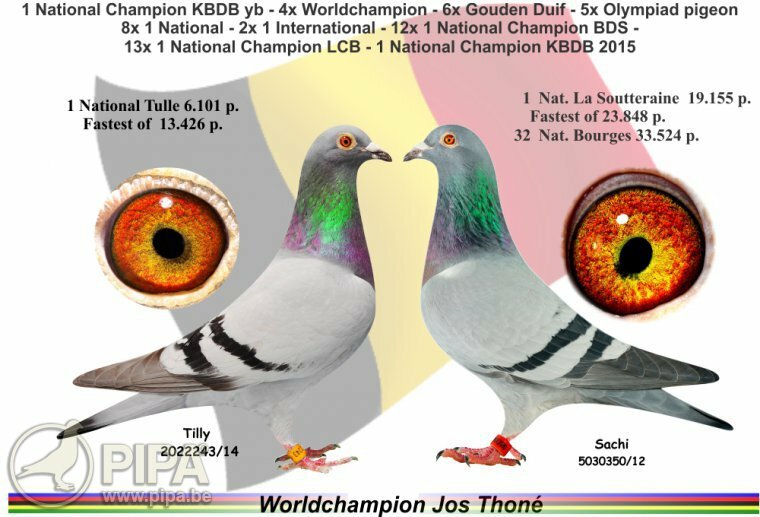 The mails that he received from the Danish and Iraqi pigeon fancier are just a few of many top performances delivered by the Thoné pigeons in a various competitions. "An auction does raise the pressure in your own loft, because you want to be back on top of your game as quickly as you can. Today, our breeding and racing loft is back in full swing, with the rise of such new champions as Bill, Billy, James, Sua, Gaggan, Pano, Sacha, Oliver, Kajan, etc. The sprint, the middle distance and the extreme long distance: team Thoné does it all. The sprint champions from As have always been consistent performers. And the sprint origins of his middle distance and long distance team have come in useful as well. Notable examples include Sachi (perhaps the fastest ever in La Souterraine, with a 50 m/min lead), Tilly (1st National Tulle with a 15 minute lead), and Sedna 1 and 2 (1st and 2nd International Narbonne with a major lead, and fastest of 10,000 pigeons). 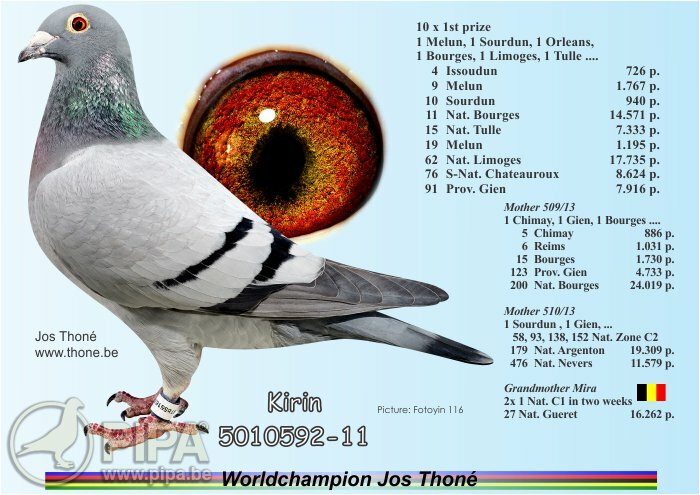 And let's not forget Goed Grijs, which claimed a national first prize from Brive of 7000 pigeons with a lead of an hour and a half. Avril (BE03-5071209) does not really need an introduction. She is arguable one of the fastest pigeons ever. She became 1st Olympiad Pigeon Sprint in 2007, she won the title of 1st Ace Pigeon LCB three times (in 2005-2006-2007), she became 2nd Provincial Ace Pigeon Sprint in 2005 and she was 2nd World Champion Sprint in the same year as well. 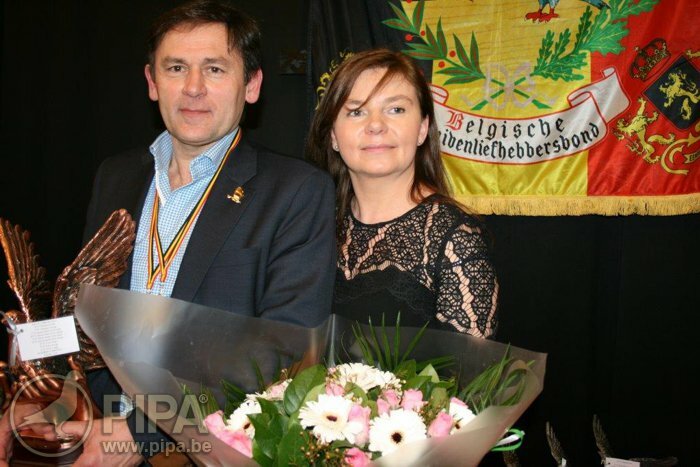 She wins 20 first prizes but she is most of all a super class breeding hen, having bred several fantastic youngsters, grandchildren and great-grandchildren. 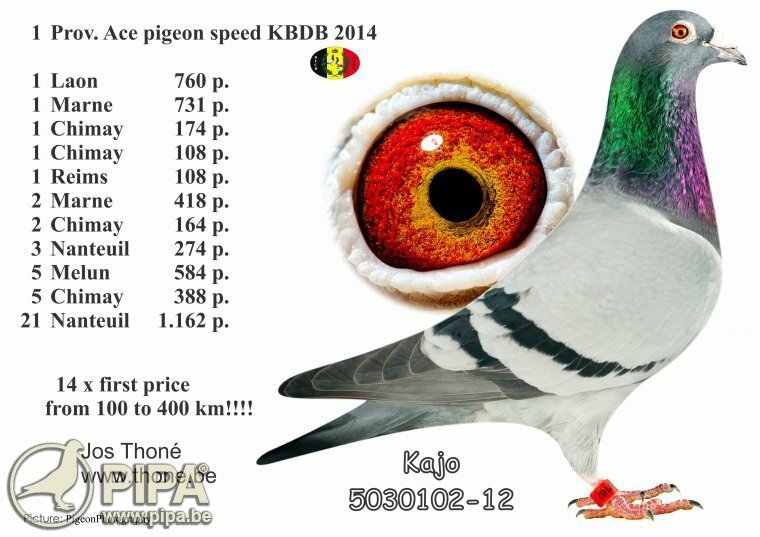 Take for instance Kajo (BE12-5030102): 1st Provincial Ace Pigeon Sprint 2014, winner of 14 first prizes, 13th National Ace Pigeon Sprint KBDB in 2015 and co-winner of the Provincial Championship Sprint 2015 (along with Thea BE12-5030332). Gaggan (BE15-2180258) was outstanding in the last two nationals from Argenton and Chateauroux: he won them both in zone C national. Click here for the pedigree of national winner Gaggan. Click here for the pedigree of James. 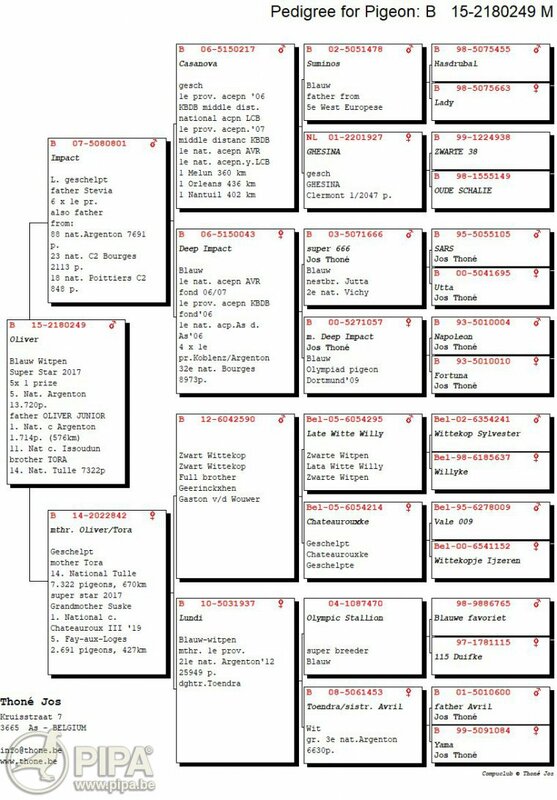 Click here for Oliver's pedigree. Click here for the full pedigree of Sua. Click here for Sacha's pedigree. Click here for Tilly's pedigree. For Sachi's pedigree, click here. Click here for Pano's pedigree. Click here for Kajo's pedigree. Click here for Babe's pedigree.